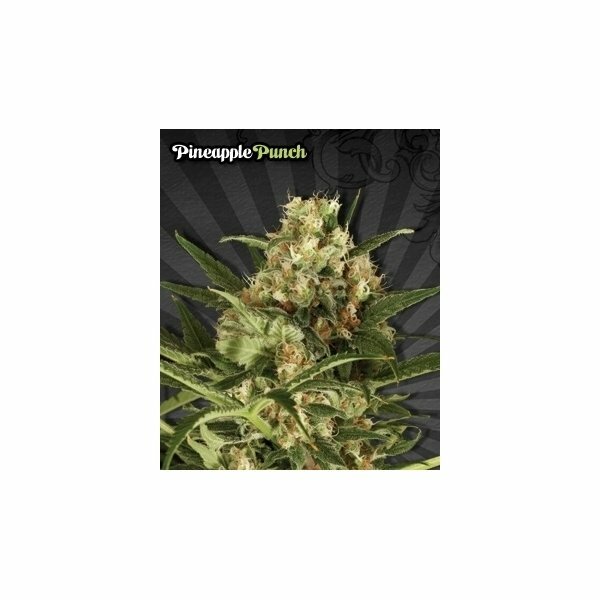 Pineapple Punch is certainly the best tasting variety among the whole range of the Auto Seeds seedbank, specializing in autoflowering and feminized cannabis strains. An Indica dominant plant that makes you sit back and enjoy the complex bouquet of this amazing marijuana. Easy to grow, fast and delicious. Auto Seeds feminized Pineapple Punch has plenty of reasons to be liked for. High THC, straightforward cultivation, fast growth (just 65 to 80 days from seed to harvest - but it is the taste that you will love it for. By crossing their original dwarf plant with pineapple and grapefruit strains, breeders at Auto Seeds managed to create weed that will mesmerize you with its exotic taste and aroma, full of sweetness and fruity notes. In terms of growth and structure this is a typical, decent AutoFem - reaching anything between 50 and 80 cm and ready for harvest as soon as 65 days from planting the seed (though for maximum crop it is advised to wait additional 2 weeks). Suitable for both indoor and outdoor cultivation. I try to write the review in english for all customers out there. Sorry for my english at first :p Planted a seed at 20th may, harvest time was at was at the beginning of August (location south austria, close to italy), lifetime of the plant was about 10 weeks. no fertilizer was used during growing time, only pk13/14 a couple of days during flowering period. I got 120g weed after 10 days drying time. Same result as with northern lights auto! About 500mg are enough to get totally brainfucked, amazing effect. Unfortunately I didn't taste pineapple, but it is yet sweet and absolutely delicious to smoke. Peace everyone. So was Leckeres habe noch nie geraucht, echtes Hammer geschmack. Hervorragende Pflanze mit etwa 30 Gramm Ertrag die mich als Purkonsument so wegdrücken, dass man eigentlich keine komplette Tüte schafft ohne an einer Überdosierung zu verenden :-) Geiles Zeug was erfahrene Raucher ohne Probleme überzeugt. I had 3 of these seeds (1 pakkage). Unfortunately 1 seed hasn't germinated but that can always happen. I got the seeds last week Teusday and now (just only 6 days after) the plants are above the grond and growing very fast... So to be short very good, strong and fast seeds along with a perfect customer service of this site makes me definitely buy again at this site! Got seeds of this a while back. Grew it outdoors and had a very nice yield. Very pleasant to smoke, awesome taste and long lasting high!